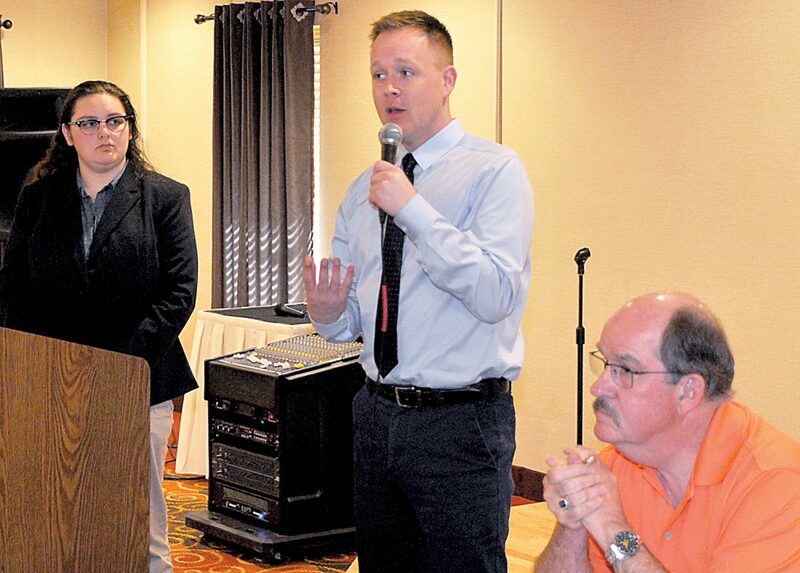 ELKINS — Two local lawmakers answered questions for an hour Thursday during the Legislative Luncheon offered by the Elkins-Randolph County Chamber of Commerce. Sen. Bill Hamilton, R-Upshur, and Delegate Cody Thompson, D-Randolph, spoke before a crowd of more than 50 during the event Thursday at the 1863 Appalachian Bistro. She asked about Senate Bill 1, which passed during the legislative session, and is aimed at increasing access to career education and workforce training. Coffman brought up House Bill 2001, which aimed to create a partial state income tax exemption for Social Security benefits. Hamilton said, “I didn’t like the way the bill finally came out .., but you’ve got to have a compromise at times… I think it will bring seniors to the state. You know, we were one of only 13 states that taxed Social Security benefits. “In the same sense, let’s just remember, we’re also giving coal companies a severance tax break, and that’s $20 million the first year, $60 million the second year and $120 million the third year. We passed that bill, we didn’t have any concerns about that. I voted against that bill because I have a concern about what that will do to our budget down the road. I don’t want to put our future legislators in dire straits,” Hamilton said. Coffman asked the legislators to discuss one business-related or economic issue that will be addressed in the next legislative session. Thompson pointed out the Legislature passed a bill this year about “innovation zones” which was then vetoed by Gov. Jim Justice. Hamilton then offered what he said was a “controversial” take. A written question submitted from the audience asked the lawmakers to comment on the opioid crisis. “Addicts are a problem, but they’re not the enemy. The pushers are the enemy,” Hamilton said. “We need more drug rehab units in West Virginia. If you dry up the people who are using the drugs, then the dealers are going to go away, they’ll go somewhere else,” he said. Thompson agreed, adding that another modern enemy is a doctor who “oversprescribes pain pills, which leads down the road to illegal drug use. “We need more drug education, more warning signs of, ‘Hey, kids, this is what’s going to happen'” if you abuse drugs. Sen. Greg Boso, R-Nicholas, and Delegate Bill Hartman, D-Randolph, were invited to Thursday’s event but were unable to attend. Lisa Wood, executive director of the Elkins-Randolph County Chamber of Commerce, welcomed the crowd to Thursday’s event and introduced the participants.